Hostika Review 2019: Is Hostika a Good Hosting? Formed in 2014 and based in Lithuania, Hostika.LT is a web host that provides basic cPanel hosting, as well as VPS, dedicated server hosting, and domain registration. Its website is in English and Lithuanian, and its servers are located in Vilnius, Lithuania. Hostika.LT is a Lithuanian web hosting company providing shared, VPS, and dedicated server hosting as well as domain registration. It features 24/7 online customer support and a 99.9% uptime rating. Its servers are located in Vilnius, Lithuania and the website is in Lithuanian and English. Hostika.LT offers Linux VPS, shared cPanel hosting, and dedicated server hosting. Its shared plans are based around the cPanel control panel and all come with unlimited data transfer and unlimited websites that can be hosted on each account. Shared cPanel hosting comes loaded with the Softaculous software installer. This provides easy installation of hundreds of useful software scripts that can add functionality to your website. Some of these include: WordPress or other content management systems, E-Commerce tools, image galleries, and much more. A free Let’s Encrypt SSL certificate is issued to every shared hosting customer, as well. This will be automatically installed within 24 hours after a domain is fully parked with its server. For customers needing their own private SSL certificate, they may purchase this separately. However, in order to install this, they will need to order an additional IP address for a monthly fee and choose the level three shared plan. Pricing for Hostika.LT plans is extremely competitive. The entry-level shared cPanel plan costs less than a small bottle of water per month and still comes with unlimited bandwidth. Compared to top Lithuanian hosts offering similar plans, these shared plans cost around 25% – 50% less. Prices for other hosting plans such as VPS are closer to average and still represent a good value. Billing cycles for hosting plans can be set to: semi-annual, annual, biennial, or triennial. Discounts for longer terms than semi-annual start with 5% off for annual, 10% off for biennial, and a 20% discount for a triennial term. At the time of this review, there was also an offer for a 50% discount for first time customers. This discount applies to the first payment/term (up to a three-year term payment). Forms of payment that Hostika.LT accepts are flexible. They are: debit and credit cards, PayPal, Paysera, WebMoney, Skrill, bank transfer, and over 50 cryptocurrencies such as Bitcoin. 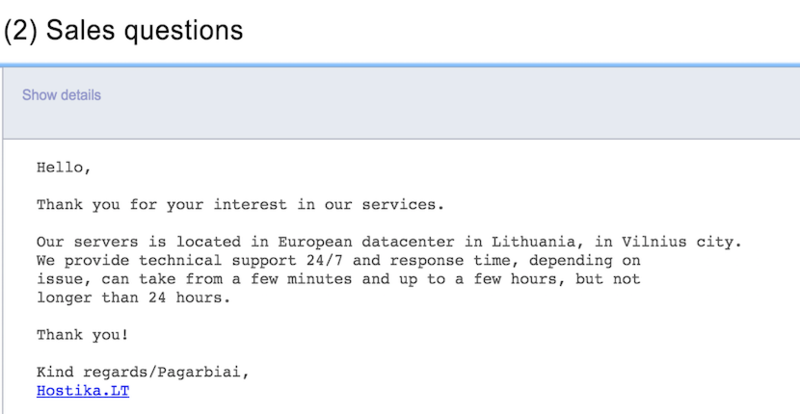 Online customer support is provided 24/7 via email ticket, and telephone customer service is available during Lithuanian business hours as well, though not for purposes of technical support. I wrote to customer support with a sales enquiry and I received a helpful response within 20 minutes. Hostika.LT is a Lithuanian web hosting company providing shared cPanel hosting, as well as VPS, dedicated server hosting, and domain registration services. Its prices are extremely competitive and it has a 99.9% uptime rating. 24/7 customer support is available, as well. Wondering how Hostika stacks up against other Web Hosting companies? Enter any other Web Hosting company and we will give you a side-by-side comparison.